Logan Bays, son of a coal miner, who was accepted to Harvard but chose to stay closer at home. The Lusk family in Wyoming County, West Virginia. Savannah Lusk is a sophomore and talks about her fight to get a highly competitive full-ride Foundation Scholarship with West Virginia University. Her father talks about why he wanted a different life for Savannah than the one he had. Dr. Sarah Beasley, the Director of Retention at Concord University talks about the dual world that some first generation students feel they belong to. Subscribe to our Inside Appalachia podcast here or on iTunes here, or on Soundcloud here or on Stitcher here. Note: These figures only represent students who filed the FAFSA and answered this specific question on the FAFSA. Since the FAFSA is not required, this is not representative of all students enrolled in 2011. This cohort includes all in-state students who attempted at least one credit hour in the summer, fall, or spring of 2011. 600 Capitol Street, Charleston, West Virginia 25301, or you can send an email to feedback@wvpublic.org. Your letter might be heard on a future episode. There's a park in Appalachia with a name that's hard to pronounce. But what's even more interesting about it is that a lot of people think it's the site of the first battle of the Revolutionary War. We hear two conflicting sides to this story in this week's show. Want to survive and graduate as a first generation college student? 1. Get Involved! Join a student club, participate in student events. This is a sure fire way to help with your college experience. Studies show students who are active in their university do 20 percent better on their overall grades. You can also learn a lot from student events, which you usually pay for as part of your tuition but many students tend to ignore. Many schools host a variety of parties, festivals and concerts but also guest lecturers and more. It’s your dollar -- use it to its fullest and get a rich college experience that's not only about academics. 2. Ask questions! Many students get caught up and overwhelmed just because they don’t understand something, or are unsure where something is. It’s okay to ask and talk to your fellow students or your professors. They are there to help you graduate. Many schools offer tutoring services, counseling services and career services to help you along the way. In the end, it’s better for the university for you to graduate on time so they provide the services to help you achieve that goal. 3. There are opportunities! Many schools have a ton of opportunities that don’t get used by students. There are scholarships, trips, internships, and other awesome opportunities lying on the ground waiting for you to pick them up. Well not literally, but you get the idea. Some take a short essay to enter, others just require you to sign up. Take time to check your student email, or look at the student bulletin boards around campus. You never know what you can find. 4. Find your OWN place! All students worry about fitting in and belonging when they get to college. Keep trying new things, and eventually you'll come to feel at home! 5. Go to class! Hey, we know that college is different from high school. Professors aren't likely to send out direct punitive actions for missing their class, but your grade will reflect your absence. Communicate with faculty if you can't be there. 6. Get to know your advisor! Don't be afraid to talk with your professors. They enjoy getting to know their students and are there to help. They're not as scary as you think. 7. Get to know the folks in your college's financial aid office. If you have any questions about your financial aid package, contact them immediately. 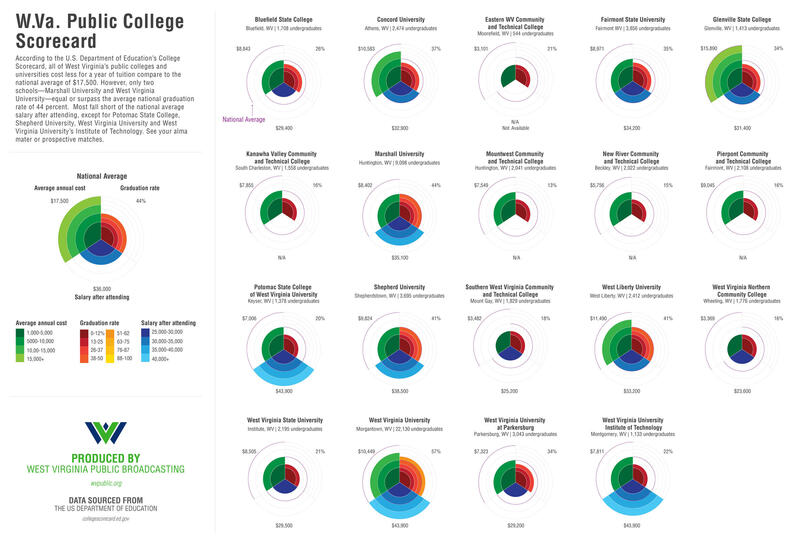 Click here to view a larger HD graphic of this public college scorecard. Music in this show was provided by Ben Townsend, Jake Schepps, Andrea Tomasi and Darlingside with "God of Loss" as heard on Mountain Stage. Our What’s in a Name theme music is by Marteka and William with “Johnson Ridge Special” from their Album Songs of a Tradition. A project that mentors high school students in McDowell County is seeing success. Eighteen students from Mount View High in Welch and River View High in Bradshaw were chosen a year ago to participate. Nearly all of them took their first plane trip last summer to Washington, D.C., where they visited college campuses, job sites and met members of Congress. Each student was assigned a mentor to regularly discuss school, life issues and choices. 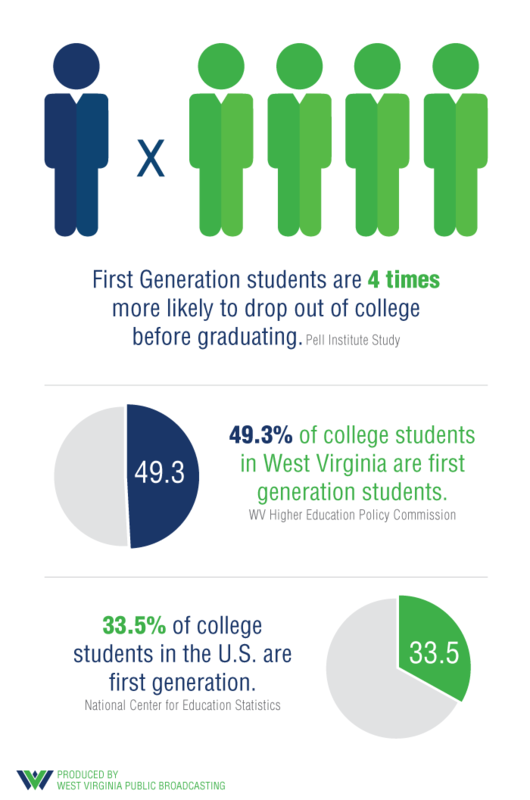 Many in-state students at West Virginia's public higher education institutions don't earn a degree after six years. An annual graduation report shows fewer than half of in-state freshmen enrolled in fall 2005 earned their degrees six years later. West Virginia University was the exception. The university's 2012 six-year graduation rate was 56 percent. Marshall University's six-year graduation rate was 44 percent, followed by Shepherd University, 43 percent; and West Liberty University, 41 percent. What's it Like to Be Young in Appalachia? It can be pretty tough to be a young person in Appalachia. There’s a lot of love for our region in the younger generation, too. So some younger people are making their own opportunities. Hear from people in their teens and 20s who are creating art and music here and listen to their ideas and dreams for Appalachia. The Front Porch: Does Harvard Have an Asian-American Quota? Is Harvard University is keeping out qualified Asian-American applicants in the interest of racial diversity? That’s what is alleged in a lawsuit. On The Front Porch, a Yalie, a Harvard man and our resident intellectual from Marshall debate whether colleges should use race during admissions. Are Appalachian students are at a disadvantage or advantage when they apply to selective schools? Perhaps a little bit of both.